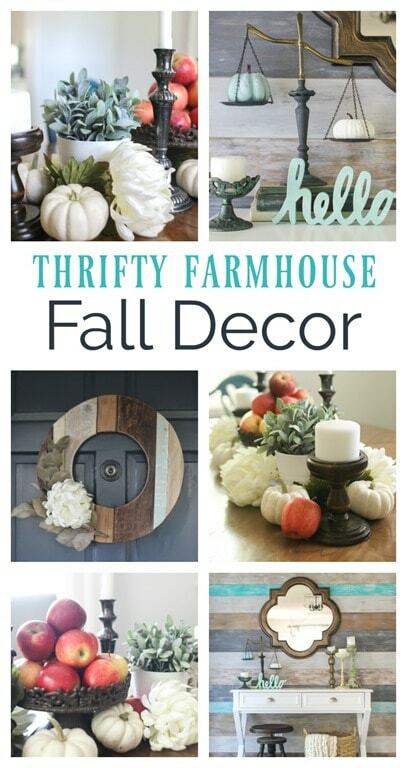 Thrifty Fall Home Tour - Lovely Etc. Happy fall everyone! I don’t usually do much decorating for fall, but this year my brain was just full of ideas so I decided to go for it. A big thanks to Kristi from Chatfield Court for inviting me to join her and a super talented group of bloggers in sharing our fall decorating ideas this week. And a big welcome to everyone stopping by for the first time from The Everyday Home. If you’ve been here before, you know I love beautiful, unique decor that doesn’t cost a lot of money. Also, I absolutely love treasure hunting at thrift stores and yard sales. And that’s exactly what my fall home tour is all about. 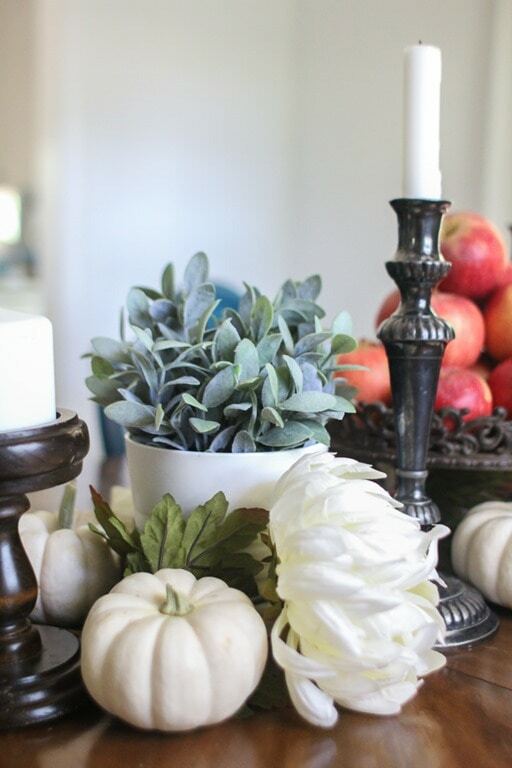 Simple, beautiful, inexpensive fall decor and a few really awesome thrifted finds. I pulled out a few favorites from my collection of thrifty finds: an old balance, some vintage books and a collection of weathered candle holders. And of course a couple of cute little pumpkins. 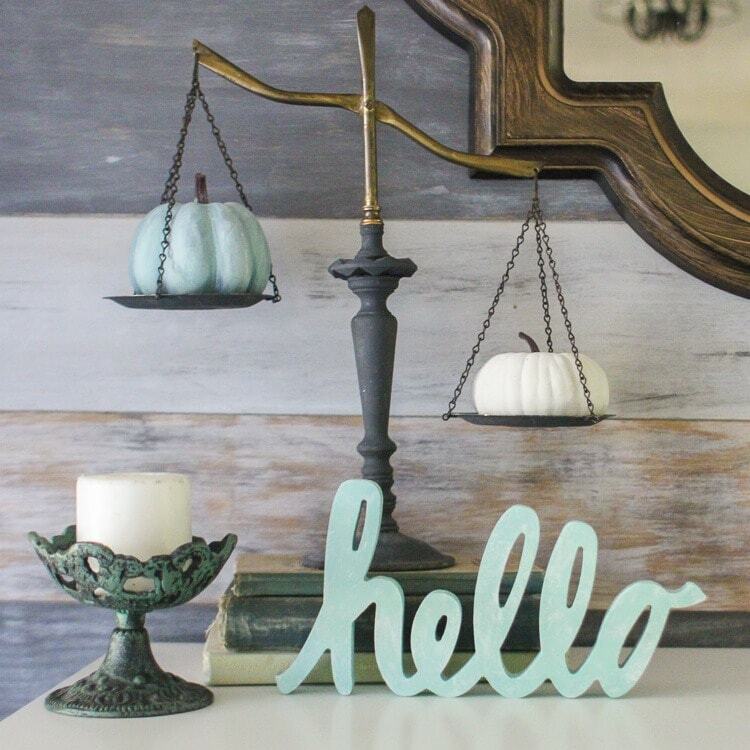 I found the cute little hello sign at the Target dollar spot a few months ago and gave it a quick update with paint. 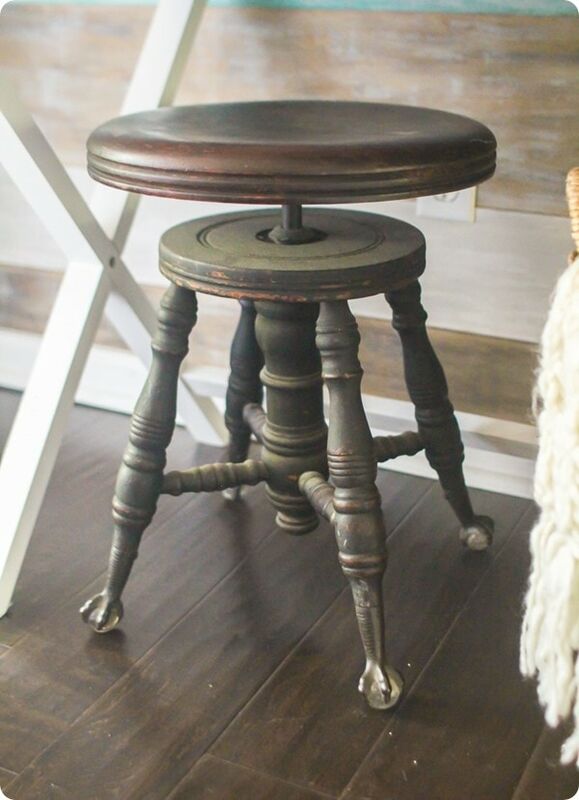 Which brings me to this gorgeous antique piano stool. I found this beauty at a yard sale last weekend for $15! Seriously, I could hardly throw my money at them fast enough. I had no idea what exactly I was going to do with it but I loved the old wood, the curvy lines, and those awesome feet so I vowed to find a spot. And I think it is absolutely perfect tucked under this little white table. The perfect mix of vintage and modern. The other spot I really wanted to add some fall touches to is the dining room. 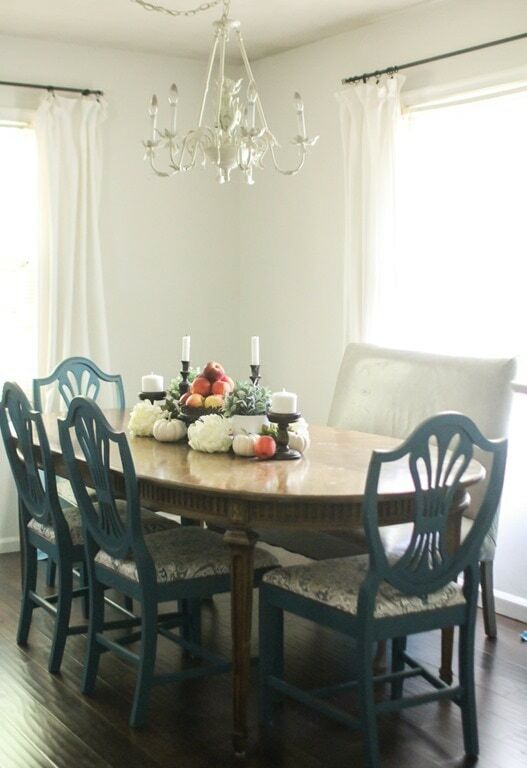 I shared my new-to-me dining table earlier this week – it was another amazing deal. And after sharing some fall table decor inspiration, I decided to see what I could pull together using things I already had on hand. And I picked up a few cute mini pumpkins and pretty Gala apples at our local farm store. 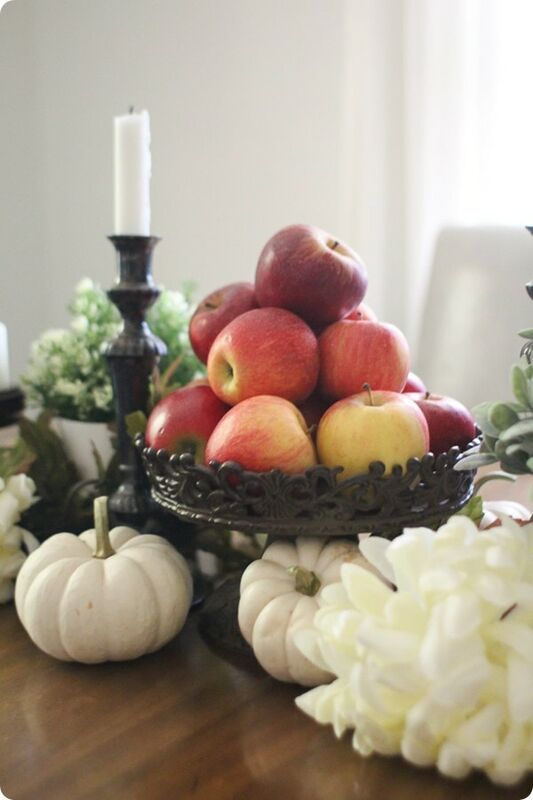 I’ve never decorated with apples before, but my family devours apples in the fall and I love the natural beauty of them. This is completely different from any centerpiece I’ve done before, but I really love it. Also, the wood grain on this table top! Even though it needs to be refinished, I adore it. I love painted furniture, but I don’t think there’s anything better than beautiful natural wood. 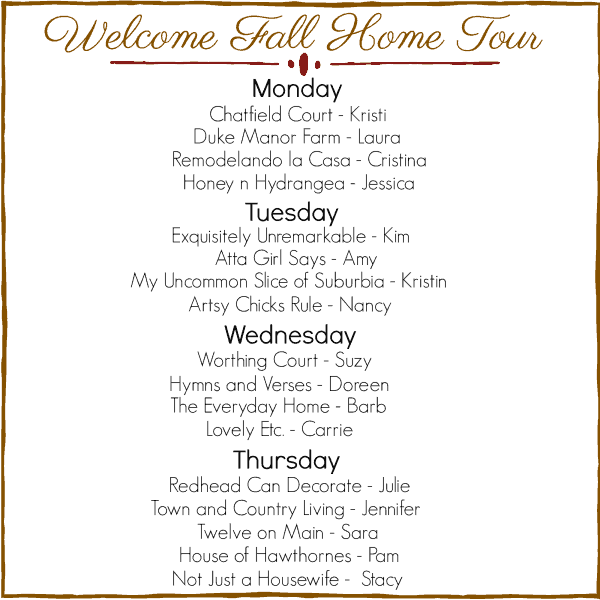 Thanks so much for sharing in my fall home tour. Be sure to head over to Worthing Court next and then visit all of the home tours linked up below. Happy fall! 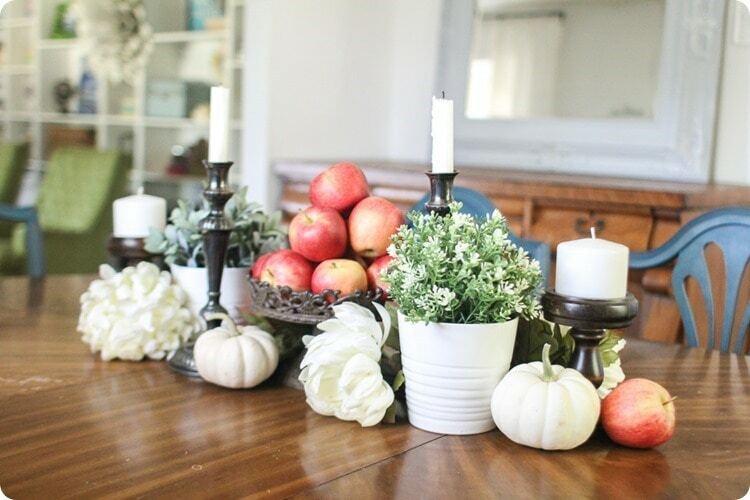 Love all the fall touches you added to your dining room and entryway (that wall though!). You’re stool find is pretty awesome too! Thanks so much for joining us for our fall home tour and for sharing your home. Thank you Kristi! And thank you so much for inviting me to join in! Carrie, that wreath is just fabulous! I am off to read about your DIY and pin it! Happy fall! Everything is just lovely! I love your fall centerpiece and that wreath on your front door is awesome! Thanks Barb! I love being able to find a use for stuff I already have! 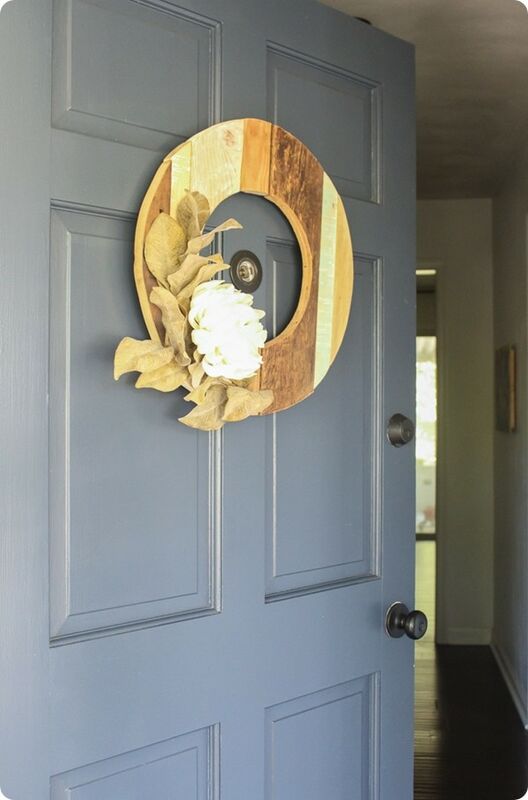 That wood wreath is so unique!! I really love it. Everything is just so prettyy! Love your home dressed for fall and those lovely rustic touches, so pretty! Thank you so much Julie! You are always so kind and supportive! Carrie, your painted planked wall is so cool! Great way to make an awesome first impression when entering your home! Thanks Jennifer – that wall is definitely my fav! That piano stool!!! Love! 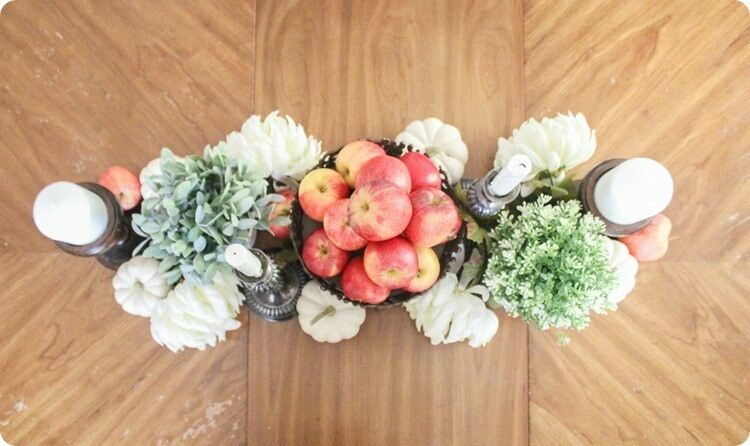 And your dining centerpiece is so pretty for fall! Thanks so much Nancy! That stool was such a lucky find! 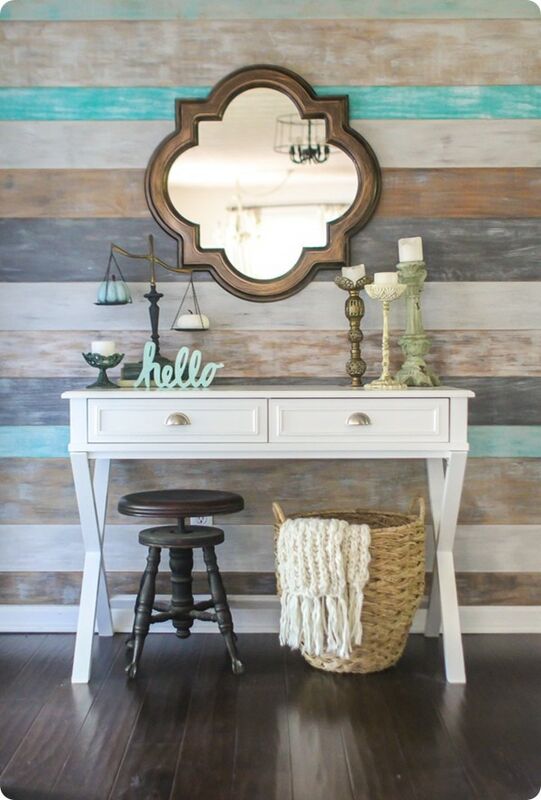 Your planked wall is one of my favorites! EVERYTHING looks so pretty up against it! Seriously though, you got the deal of the century on your piano stool! Thanks Pam! I totally agree – even when I have no idea what I’m doing with decorating, it looks good on that wall. Lol. hi carrie- i love your take on your fall wreath. perfect! your planked wall is gorgeous. now that you are decorated beautifullly for the season, i hope you enjoy fall. Thank you! I can’t resist adding blue to everything! Love all the beautiful fall decor! Your home is decorated beautifully for fall. 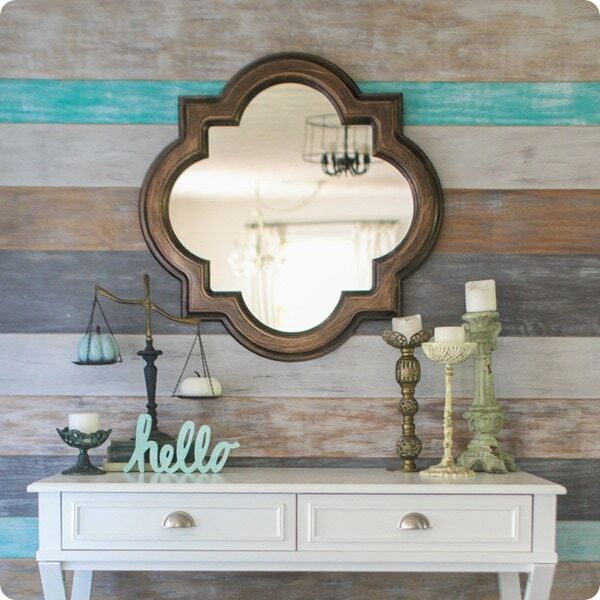 I LOVE your painted plank wall!